Cole Brothers Circus has agreed to pay the U.S. Department of Agriculture $15,000 to settle a lawsuit alleging abuse of the animals. Allegations against the circus included that elephant handlers has repeatedly struck an elephant with an ankus — a hook or goad used in elephant training — during performances, according to a USDA report. Elephant trainer John Walker III hooks Viola the elephant inside the ear and drags her around the ring as she trumpets in pain. You can see at one point he tugs the hook downwards and she leans down too. I have witnessed Walker constantly yelling at the elephants. When I met him the first day of my undercover work I asked what the large elephant’s name was. He told me “I have many names for her but her name is Viola. It’s one of those days.” Viola seems to take the brunt of a lot of his anger and abuse. 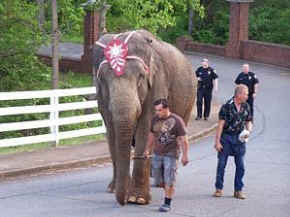 Last year Viola (photo right) escaped the circus and fell down an embankment. After 30 minutes they were able to recapture her. She is at her breaking point. This week, as the circus arrived in Fredericksburg, Maryland, animal protection groups gathered at the entrance of the fairgrounds to protest the abuse of the animals.